If you came here expecting to find StephenMontagna.com, you’re not that far off; I’ve re-located my blog from WordPress.com to my server space here on Dreamhost. In the coming weeks, I’ll be restoring (and building upon) my StephenMontagna.com pages, but I’ll be integrating them with this here blog. It’s my excuse to finally push myself to learn WordPress and all its ins and outs. 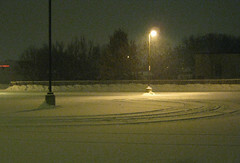 I drove home, grabbed my camera and walked back to snap some shots; these really don’t do it justice – it’s that fun you experience as a kid when you turn a flat, white surface covered with new-fallen snow as a canvas and “paint” something on it. Perhaps it’s nostalgia, what with having woken up this morning to find the whole ground blanketed with snow, suddenly the crisp days of Fall (my fav season) seem very far away. P. dropped off this shot of our trip to a WI farm a couple of weeks ago. 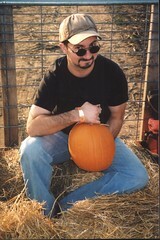 Yep, that’s me with a pumpkin that I freed from the earth just moments before. This is what’s wrong with Congress at the moment, both Democrat and Republican; they say they don’t want to “play Russian roulette” and yet they’re willing to “vote for it and let the chips fall where they may? !”For goodness’ sake, show some leadership; sit down, roll up your sleeves, figure out a viable solution that doesn’t give tax breaks to the very people who have derided taxation and gov’t intervention for the last thirty years. Do your #$^&ing job in other words. We are in this process of American roulette these days. We are victims of our own greed and lack of participation in the process of the very democracy that runs our lives. This is a real mess, it deserves a real solution, not just throwing money at the problem. How do you fix an engine while it’s still running? Do you fix a flat with the car still in motion? No, you pull over to the side of the road, turn off the engine, and go to work. This is what we need to do as a Nation. It means that some people will not reap tremendous profits for a few days, weeks, months. So be it; we always talk about sacrifice for our country in terms of losing one’s life in a war; it’s time to think of lower level (but still honorable) sacrifice to the tune of putting the needs of the Nation above those of ones individual financial or corporate profit. 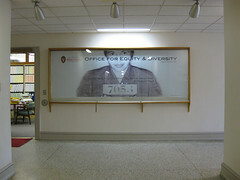 Yes, it took nearly twelve months, nearly a dozen meetings, conflicting opinions, and at times “design by committee”, but it is done, and more than $100 under budget, and it raises the visibility of the Office for Equity & Diversity about 100%. I am not one to gloat… but I must admit I’ve earned the right to pat myself on the back on this occasion. If you live in, or are visiting Madison, and you happen to make the hike up Bascom Hill, come take a look. As I made my way back home, three hours later (no joke), I thought about the time that had elapsed; I thought about how, in general, so much of my life these days is spent… proving myself. I think it’s something my partnered, happily employed friends can’t possibly understand; between job hunting and online personals an enormous amount of time and energy every day goes towards continually proving myself — proving myself worthy of being hired and worthy of being loved. This is energy my peers who have already found their dream job (or at least something stable and in the field of study they spent their college years pursuing), and a mate, do not have to spend. And no wonder, then, that they seem more well-rested, buoyant, and productive. They simply don’t have to prove themselves every day. Now, I understand – jobs of every stripe can be challenging; and relationships, even well-balanced, loving ones, take work. But that’s different; having to take time to talk something through with a spouse is different than having to earn their initial trust, affection and support. I can’t help but wonder what I could be accomplishing in my life if I didn’t have to expend so much energy every day constantly trying to prove my worth as a human being. Wow, what an experience! 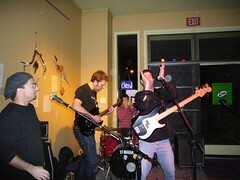 Friends of mine formed an ad-hoc band to play a fundraiser for Alliance for Animals at a local coffee shop, and they roped me into doing some vocals and adding harmonica to some ’80’s covers. Yes, as an actor I’ve been on stage hundreds of times, but nothing prepared me for this; first off, the “band” had barely rehearsed at all; it’s composed of two fellows from a legitimate band (The German Art Students… they rock – check ‘em out), but who were playing instruments they usually don’t play; plus my friend Pat, plus me. Also, it’s difficult to explain what it’s like to try to speak/sing/play an instrument when you’re literally surrounded by sound; I could barely discern the notes that were emitting from my harp (the sound set up at the coffee shop, though decent, did not allow for monitors – speakers facing us, the players, so we had no way of directly guageing the performance other than the roar of the crowd, which only added to the din). All in all, I had a blast (though I wish there had been more groupies… I was really counting on a lot of groupie action…). Glad I did it. Don’t know if there will ever be an occasion like it again.